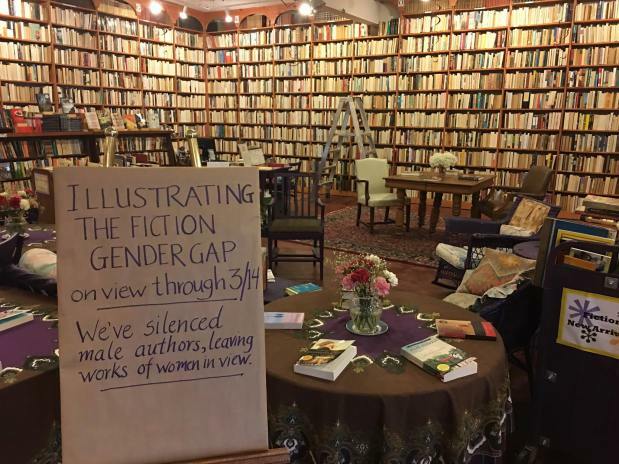 All puns intended here, an Ohio Bookshop has chosen to celebrate International Women’s Month by effectively silencing all their male authors — and doesn’t that make a nice change? — by displaying them spine inwards. Loganberry Books, a feminist-oriented bookstore, and their small staff worked through around 8,000 books in order to protest the historical suppression of women’s voices and to ensure their voices are now heard in this playful and potentially controversial exhibition. The act means that only female authors are left on view, their voices, narratives and histories made visible against their newly anonymous male colleagues. And it does make an interesting turn of events, especially as women’s literature and history has for so many centuries been oppressed and censored in myriad ways. Varied attempts only the last two to three decades have been made to render women’s words more salient: it’s a great thing to see that continue in new and interesting formats. In conclusion, I suppose, Happy International Women’s Month!